With Apple's iBooks Author app, you can create rich, interactive books for use on the iPad, and this new For Dummies handy portable guide shows you just how to do it. Whether you want to create textbooks, training materials, marketing reports, or awesome product manuals with dynamic content, this book takes you through the process. Plunge in, and you'll soon learn how to create an iPad e-book with all the bells and whistles, including video, interactive widgets, text, tables, figures, colors, cool fonts, and more. iBooks Author For Dummies is what you need to get your book off the ground and into the hands of readers in a hurry! Galen Gruman is principal of the Zango Group, producing print and e-books. 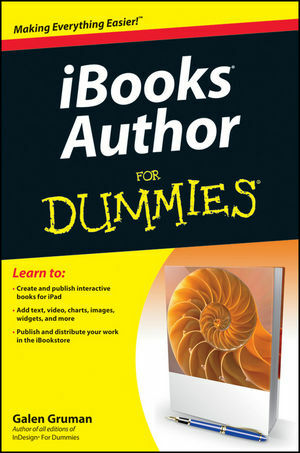 He is also author of several books, including the InDesign Bible, Mac OS X Lion Bible, and Exploring iPad For Dummies.